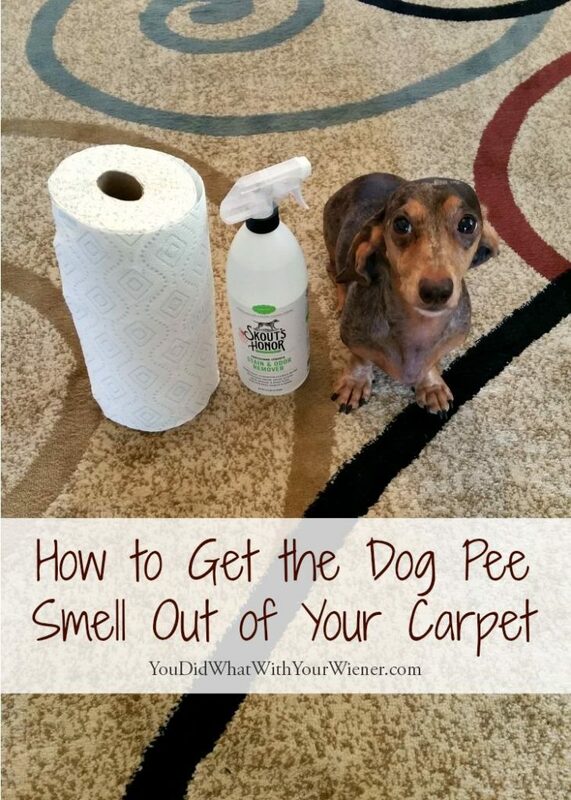 Trying to get the dog pee smell out of your carpet is a frustrating task that comes with being a dog owner. Over the years, I’ve had to deal with dog pee from a dog learning potty training, a dog with separation anxiety, guest dogs we were sitting that were confused about where to go potty, and now a senior dog with incontinence issues. Although I’ve found many ways to deal with a senior dog that pees in the house, there will always be the occasional puddle on the carpet to clean up. Luckily, we have wood floors in our current house. We use area rugs and they can be replaced if they get too stained or smelly. Although I get them through Overstock.com at a discount, they are still not cheap. I also hate the thought of sending them to already overtaxed landfills if I don’t have to. I try to clean any dog pee accidents as best I can but the pee smell is strong and I fear it my houseguests can smell it. If you have permanently installed carpet, dealing with dog pee can be a real mess – pun intended. I used to live in an apartment with carpet. Whether you have area rugs on a hard surface, or installed carpet, cleaning up after your pet is a chore. With the help of Sears Carpet Cleaning, I’ve compiled some of the best tips to remove the smell of dog urine out of your carpets. Many people have tried the vinegar plus baking soda route and been successful. The great thing about this method is that it’s natural and you probably already have the supplies in your pantry. This method isn’t 100% reliable, but it is always worth a try. To clean using this method: Start with a 50/50 solution of white vinegar and water. Pour the solution on the spot, get out your scrub brush, and put some elbow grease into cleaning the mess up. The vinegar neutralizes the ammonia in the urine, which is the first step of eliminating the odor. Once the spot on the carpet is dry, sprinkle baking soda on top of it. After that, get some detergent and hot water and scrub it again – this time like you’ve never scrubbed before! Once the area is dry again, run the vacuum over it a couple of times and you’re set! Pre-made products designed to remove pet and stain odors from carpets are convenient. They’re usually a one-step process and you can grab them in seconds. As with the vinegar and baking soda method, they don’t always work but they’re certainly worth a try. I’ve used several different ones and their effectiveness has really varied. My favorites are Biokleen Bac-Out Stain and Odor Eliminator (my #1 fav right now), Nature’s Miracle Advanced, and Skout’s Honor Urine Destroyer (affiliate link). The instructions for how to use the cleaner varies and can be found on the back of the container. 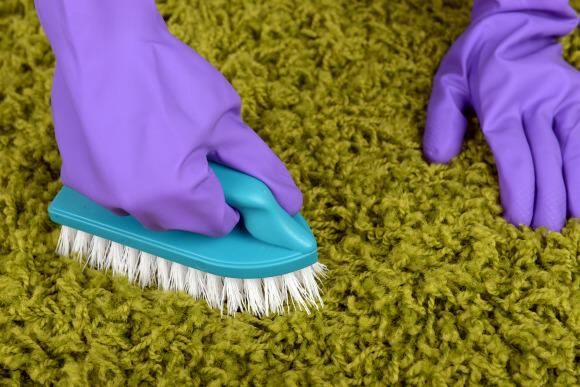 However, it usually requires that you soak up as much of the dog pee as you can, saturate the area with the cleaner, wait a while (sometimes up to 30 minutes), soak up as much of the cleaner as you can, and allow the area to dry naturally. This should always be your worst-case-scenario option when it comes to cleaning stains and only use bleach on white carpets. Colored carpets will fade. If you’re going to use bleach, make sure to open any nearby windows and keep your pets in a completely different room to prevent the fumes from affecting them. One thing to keep in mind is that bleach itself won’t clean the carpet. You will still need to thoroughly clean it using a carpet brush and carpet shampoo or cleaner to remove the pet odor. Using bleach and the carpet cleaner can be effective, but should not be your first option. While home remedies can work on light stains and smells on your carpet, pet owners who experience frequent accidents from their canines might need to bring out the big guns. The most reliable and efficient way to get rid of those stains and smells is to get a professional cleaning crew to your house. Professional cleaners are highly-skilled technicians who are trained and background-checked to be the best in the industry. 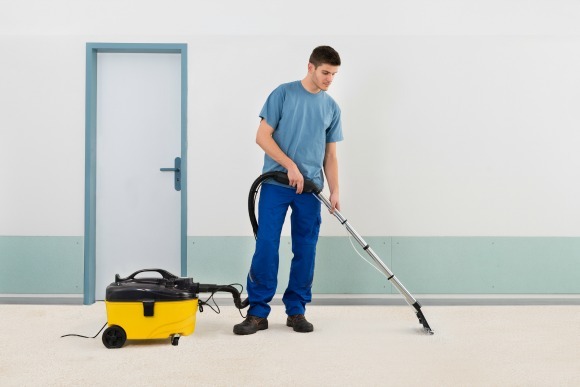 They will get your carpet clean from top to bottom and rejuvenate spots that seem to be at the point of no return. CLICK HERE to find a Sears carpet cleaning professional in your area. Dealing with pet urine is certainly not fun, but it’s inevitable. Even the cutest of pups have accidents sometimes. If you do choose to use a home remedy, always make sure the items you’re using to clean your carpet are pet-friendly or block off the area of the room so your 4-legged pal doesn’t get hurt or sick from the chemicals used to clean the carpet. I have a good non-commercial carpet cleaning machine. It doesn’t do me much good now but I did use it a couple of times in my old, carpeted place. It was great. I think it’s the Bissel 12x power. My model is almost 10 years old but I see it’s still one of the higher end models available. It definitely doesn’t get as deep into the carpet and pad as a commercial cleaning though. I find that Nature’s Miracle can work wonders for both dog and cat pee. In fact, we would be pretty lost without it. We have recently downsized to an apartment with carpet so we really need to keep it clean. Our daughter had an old, sick cat who made quite a mess, and we went crawling on the floor to find areas to treat with Nature’s Miracle. It worked great! Unfortunately the cat has since passed away. But Nature’s Miracle saved her apartment! I also agree…wood floors are the way to go…if you can!!! The firt thing I do it grab a large stack of facial tissues. Place the pile of tissues on the wer spot and stand on it for a minute. Then repeat until the tissues are dry. It takes a whole box of tissues. Then I use a mixture of half water and half peroxide in a spray bottle. I soak the spot. Scrub with a rag. Blot up the excess and spray once more letting it air dry for a day. This is on my light blue and light mauve carpets. I haven’t tried the peroxide mix on my new dark brown carpet. It may lighten the spot. Is there a reason you use tissues instead of paper towels? Yes, Facial tissues are more absorbent than paper towels . I have used Natures Miracle for years with additional instructions that I picked up from the book the “Queen of Clean” wrote & my own experiments … soak up as much as possible of the urine on a paper towel (do not rub), pour a cup of boiling water on stain & soak up with paper towel (do not rub) now pour a generous amount of Natures Miracle & lightly spray with cold water. Cover the treated area with plastic wrap. Leave for 24-48 hours. You can repeat if necessary such as vomit stains that are tougher to remove. The author explained that the slight amount of water along with the plastic wrap (I prefer Press N Seal) help the enzymes work. I understood that they need moisture to perform the task & the plastic wrap helps it from drying out. And no stinky smell either…it works great for me. As a mom to two boys, one who didn’t potty train until after age 4, I could have used this trick back then. It was a crazy time of urine on mattresses, having to get new ones all of the time as you could never get them clean or smell out. I am certain this will be helpful for parents who had to deal with the same thing!